Additional Info: Our digital version also includes the Index to Mormonism—Shadow or Reality? 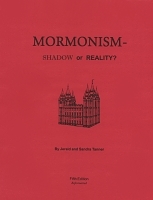 Sample PDF: Sample PDF of Mormonism—Shadow or Reality? Jerald and Sandra Tanner's most comprehensive and revealing work on Mormonism. Writing in the October 1990 Sunstone, book dealer Curt Bench compiled "A list of the books which have had a significant influence on the development of Mormon history, theology, and literature." The Tanners' Mormonism—Shadow or Reality? was listed among the 50 important books on Mormonism in the first 150 years (1830–1980). Mormonism—Shadow or Reality? deals with: new discoveries relating to Mormon history, changes in Joseph Smith's revelations, Joseph Smith's 1826 arrest for 'glass looking,' proof that the Book of Mormon is a product of the 19th century, changes in the Book of Mormon, archaeology and the Book of Mormon, changes in Joseph Smith's History, the First Vision, the Godhead, the Adam-God doctrine, the Priesthood, the missionary system, false prophecy, Joseph Smith's doctrine of polygamy, polygamy after the Manifesto and in Utah today, changing the anti-black doctrine, the rediscovery of the Joseph Smith Papyri and the fall of the Book of Abraham, Mormon scriptures and the Bible, changes in the Pearl of Great Price, Blood Atonement among the early Mormons, the Word of Wisdom, Council of 50, the Danites, the temple ceremony, changes in the temple ceremony and garments, the Mountain Meadows Massacre, Mormonism and money, plus hundreds of other important subjects.